I’m pleased to announce a celebration of my second novel, The Light Gets In, with a book signing event on Sunday, November 9 at 1:30pm at the Cypress Restaurant. In this sequel, Ben, Maia, and Tina, accompanied by their faithful canine friends Orion and Stella, continue their adventures from TO SAY GOODBYE. Ben, loyal to his father, obsesses about his widowed mother’s potential relationship with a family friend. Maia is bored with her job until she learns she might lose it. Tina, Ben’s daughter, is determined to keep things status quo and her career on track despite a second pregnancy. Contrary to everyone’s expectations, life’s events send them all into uncharted territory. British secrets, an abandoned mansion, and Mother Nature challenge Ben, Maia, and Tina to let go of their search for perfection and recognize the value of their flaws. For it’s through the cracks that the light gets in. Jen Eifrig (a writing colleague whose first novel, Discovering Ren, will be out soon!) and I were featured on a local cable station talking about navigating the publishing world. Aired on October 19, you can now watch it here (thanks for Michele Rousseau for the YouTube posting). And feel free to“follow” this blog, www.BethLapin.com, by clicking on the right below Pages. During this season of Thanksgiving, let’s all give thanks for all we have – our health, our loved ones – and send our best wishes to those who are still struggling to regain their footing after the storm. Continue to rest of Blog! Members of The Novel Group (TNG), a community of unemployed or underemployed writers who meet in the Middletown area, celebrated the recent publication of one of their associates’ novel. 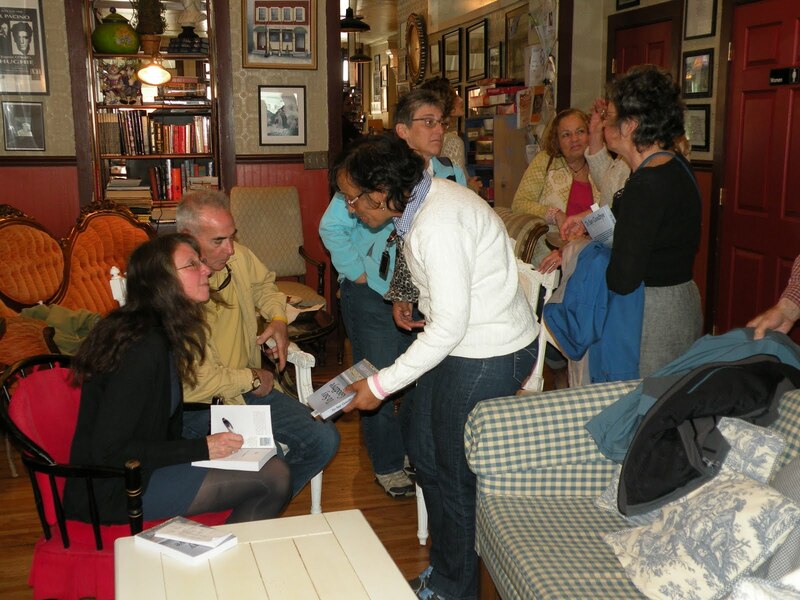 Friends and colleagues surrounded Beth Lapin, author of To Say Goodbye, on Saturday, March 31 at the Cypress Restaurant. Read more about it here. Dozens of family, friends, and customers crowded into the back room of Muddy Waters on Saturday to celebrate the publication of a New London native’s first novel. Beth Lapin’s book. To Say Goodbye, has just been released by Wings ePress. Lapin credits her New London roots for some of the book’s development. 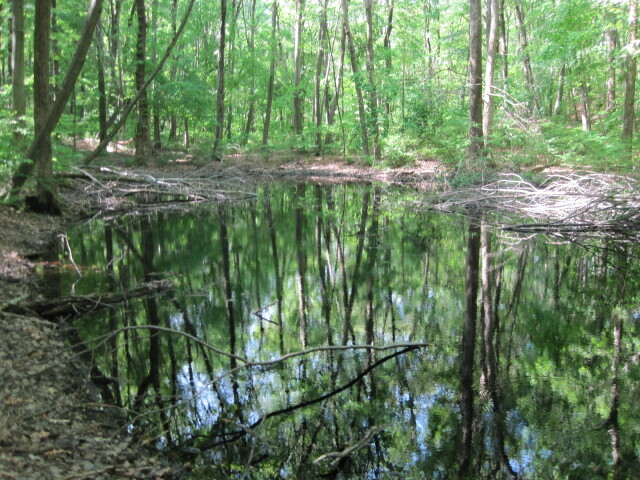 “I have strong ties to the Connecticut coast, which is where this book takes place. And I got a solid foundation from my New London education.” She told the group about the start of her writing career in 2009, when she lost her formal job, and shared some of her experiences while writing the book. “Ben’s mother just showed up,” she said laughing. “I tried to delete her, but my fingers kept typing her arrival.” She shrugged. “I had no choice but to let her stay.” Beth also described her second book, a historical novel about gypsies in Connecticut in the 1800s. “I’m looking for a publisher for that one,” she added. “Your mother is up there clapping,” whispered her aunt Connie Horlink, who had traveled from Milton, MA, to attend the book signing. A friend, Sharon Rogolsky, took the train down from Boston; another, Elliott Krinsky, came from New Hampshire. Alan White, a special high school friend, brought a red rose. Beth’s daughter, Kay Hammerson, sold books. 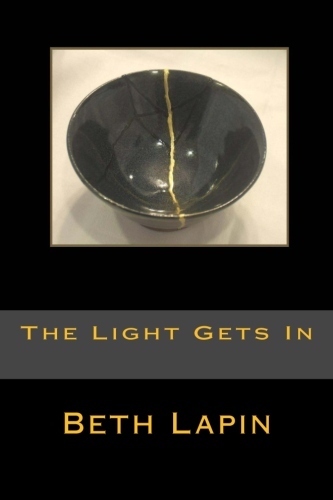 Beth will be holding another book signing on Saturday, March 31, at 1pm at the Cypress Restaurant in Middletown, where she currently resides. For more information, see www.BethLapin.com or email: Beth@BethLapin.com. 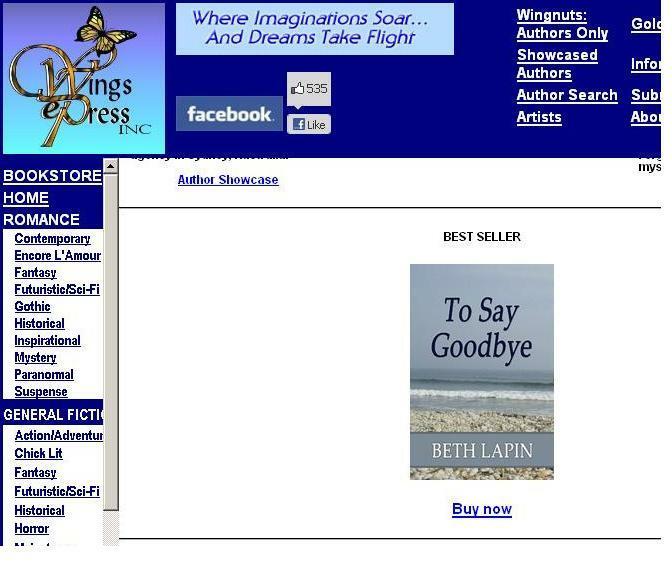 My book, To Say Goodbye, was named a best seller! Well, it’s not the New York Times list, but it was the best seller for February releases from Wings ePress! Thanks to those of you who helped that happen.